CHOOSE KIND /‘Wonder,’ the popular book and major motion picture, inspires a challenge for HMS students. The book was published in 2012 as a children’s novel written by R.J. Palacio. It was released in movie form this fall with starring actors Julia Roberts and Owen Wilson; by Christmas day, the movie had grossed $174 million. That’s the power of “Won­der,” a national phenomenon that is challenging the world to encourage others rather than tear them down. The book and movie tell the story of fifth-grader Auggie Pullman, who has a medical condition, often equated with Treacher Collins syndrome, a rare medical facial deformity that has caused him to have many surgeries. Auggie encounters taunts and insults for his appearance, but he also kindles a friendship with fellow classmates Jack and Summer, both of whom defend him from the taunts and insults. The challenge to choose kindness may be simple in concept, but not always easy for students navigating middle school hallways and feeling less than accepted by the in-crowd. HMHS faculty Tamara Cassidy, Stephanie Sinclair and Janet Whisen­hunt, all fans of the novel, began to think about ways to challenge students to choose kindness in uncomfortable situations. The next step was to consult with Clint Corby, HMHS principal, about a plan to promote the message. “I brought it up to Clint about the movie coming out, and if he could coordinate with something as a reward, because when they were signing the wall there was no reward attached to it,” Cassidy said. 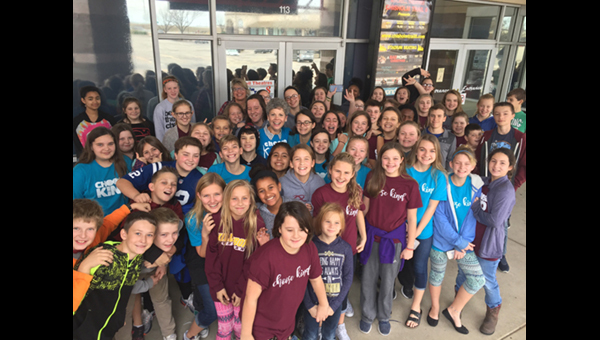 Sixty students, from sixth to eighth grade, went to see the movie at the theater in Newton. “That’s more than a third of our school,” Sinclair said. Encouraged by student response, Sinclair and Whisenhunt began work on the idea of creating T-shirts to promote the “Choose Kind” goal. The shirts come in different colors and different print fonts to broaden their appeal. “So, now that we’ve seen the movie, we’re pushing being a student kindness ambassador—so there’s another challenge,” Whisen­hunt said. One way the planning group has enhanced the impact is by developing a worksheet with tangible ways to chow kindness to others. The student council is helping to promote the theme, and several parents have told the sponsors that they are reading the book to their children at home. The plan is to continue the “Choose Kind” challenge through the rest of the school year. “We just need to challenge them with resources,” Cassidy said. “We tell them to be kind, but they’re like, ‘I’m already a nice person.’ So we’re giving them specific things, like smile at three people you wouldn’t normally smile at. And, give someone who is not in your friend group a genuine complement that’s not about physical appearance.